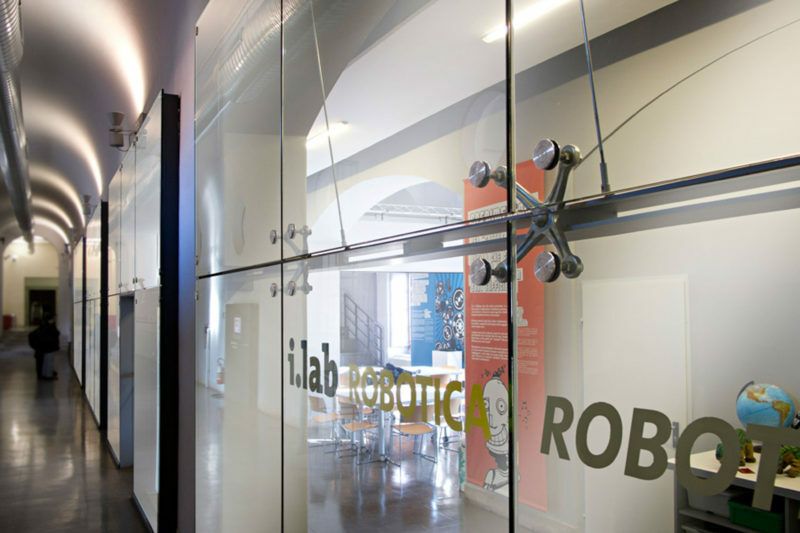 The permanent section of the Lab.s is part of the EST Project (Education for Science and Technology) sponsored and funded by Fondazione Cariplo with the goal to enhancing the educational activities with schools. For the project dedicated to the laboratories of Robotics and Biotechnology at the Museum of Science and Technology an experimental proposal was studied to avoid confining the teaching activity in closed rooms of the Museum: transparent walls were fixed in the hallway of the main distribution of the mezzanine floor, called “New Frontiers”, creating the spaces for the Lab.s. The main objective of the project was to make the laboratory activities fully visible (but at the same time soundproof) ato visitors of the museum. The same visitors can interact with the topics of robotics and biotechnology playing with the exhibits placed controlled in the hallway.